The following is an edited letter from Alan Fenster, attorney for Albert Mizrahi, owner of Larchmont Bungalow. As the attorney defending the Bungalow from charges it is in violation of its permit to operate a take-out restaurant on Larchmont Blvd., I believe it is time to challenge the misstatements and outright falsehoods leveled against it. In fact, the Bungalow is lawfully operating as a take-out restaurant and the city’s prosecution is discriminatory and without merit. The owner purchased the aging property at 107 N. Larchmont in 2007 with the intent to tear down the building and construct a new two-story building in its place. Councilman LaBonge met with the owner in his home and asked him to consider other alternatives, as he did not want to change the “character” of the community. The owner pointed out that the building was limited by its design in the type of retail that could be utilized, indicating that only a restaurant could properly function under the existing constraints of the building. The owner designed a take-out restaurant, which ultimately cost approximately $1 million to construct. The plans were ready to be approved when, with no notice whatsoever, the owner was asked to sign a covenant that there would be no tables and chairs in the restaurant. There is no law, rule or regulation in the city or in the Larchmont Q conditions, which state that a take-out restaurant is prohibited from operating with tables and chairs. In fact, any observer of the numerous take-out restaurants on Larchmont will readily observe that they are all filled to the brim with tables and chairs. Having just gone through the long ordeal of preparing his building plans and believing that the city would allow his take-out restaurant and expecting to be treated like any other take-out restaurant on Larchmont, the owner, who was suffering from a rare blood disorder at the time which seriously undermined his energy and mental functioning, signed the covenant. Subsequently, he discovered that the city had no right to require such a covenant, and it was unlawful and unenforceable. He opened his restaurant and installed an appropriate number of tables and chairs. Since that time, the Bungalow is a welcome addition to the business life of Larchmont Blvd. 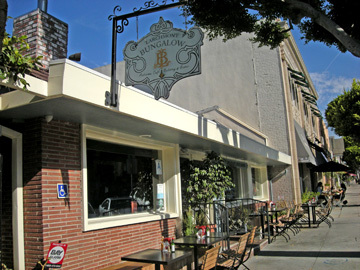 Business records of the Bungalow reflect that its primary business is as a take-out restaurant. The City, however, continues to treat the restaurant differently than all the other take-out restaurants on Larchmont. The question is not why is the Bungalow still operating. The question is who, and for what reason, is behind the persecution of this highly popular take-out restaurant.